Sisters Who Crop | Priya the Blog | life & style in Nashville & beyond! Good Wednesday to you! I mention my sister Carina to some capacity in nearly every post. I'm #blest that many of my most fabulous hand-me-downs come directly from her. This top being no exception. She purchased it in this size first, (and this is so Carina, you guys) ended up going back for the smaller size, and "never got around" to returning the bigger one. Which she then gave to me. This, along with this skirt, being one of the carefully curated hand-me-downs she gave me last time I visited her. I wore this Sunday night; when I went out to dinner with Carina and Huntee at Chauhan Ale & Masala House. If you're in Nashville and have never been: GO! It's mostly authentic Indian food, with some Southern/British fusion thrown in, and their house-made craft beers. And the place itself is too cool. I should've thought twice about the crop top + big dinner thing, but oh well. I was excited to wear these shorts again, because I haven't worn them since last time. And look who I got to jump in some outfit photos with me!! Peanut! Also notable is that we're wearing our matching jean jackets. Sometimes this blog feels like a love letter to my jacket. I've told the story of this jacket several times on the blog, even done a remix with it, but I swear I still love it more with every wear. You look really really fabulous dear Priya! These pictures are so cute!! I was going to ask if you were wearing matching jackets but thought it impossible since you've had yours for so long! I love when crop tops just show the SLIGHTEST of skin. Looks so classy and stylish. You guys are adorable! Sisters are the best, especially when they give you clothes! This outfit is absolutely adorable on you! Love the crop top and it's so nice to get clothes from your siblings. My sister is younger than me and I'm actually always stealing her clothes. You are and your sister looks so cute in your matching jean jackets... 11 years? wow! My goodness, you and Carina are so cute together! I wish I had a sister... haha. Okay, but seriously...this outfit is AMAZING. 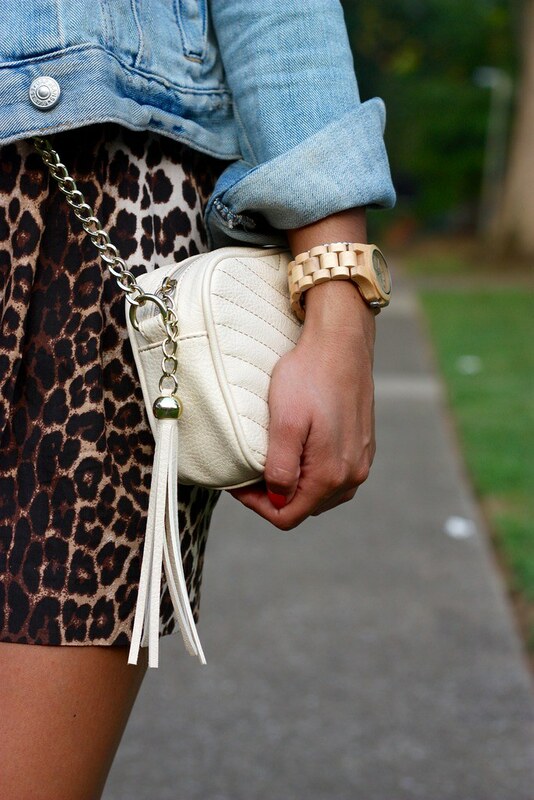 Your top looks phenomenal on you, and those leopard shorts are just gorgeous! Ugh. You're just so cute. You are so sweet Brynn, thanks so much!